Do you enjoy mini-game puzzles? When playing D&D, back in the days when everything was done with a pencil and paper (and almost too far back to remember now) I used to enjoy creating puzzles for my players to try to solve. It was all part of the great gaming experience that made D&D what it was (in my opinion) and while some players might baulk at the idea of finding one, the majority would approach the puzzle with enthusiasm for the challenge. From the poll I took in August last year, it would seem about 55% of players (who read my blog) also enjoy puzzles. When it comes to designing puzzles in a CRPG, however, a builder is limited to their knowledge of the scripting language, and XML if they want to design new interfaces for puzzle interaction. Furthermore, designing a puzzle to be included in such a way as to not appear orchestrated can be difficult to achieve. This last point, however, is also true for classic D&D. Yet, these obstacles aside, I believe there is room for a little "poetic licence" to allow the builder to be creative with their ideas and include puzzles as a minor distraction to the normal flow of events. If a player can accept the game with this premise in mind, then it can be fun all around. I do recognise, however, that some players do not like puzzles at all, or find some puzzles a frustration rather than an enjoyable distraction. With this in mind, I have tried to ensure the player does have an alternative means to bypass a puzzle and to move the game forward. Such bypassing does come at a cost (gold or Life Essence), but this should not be seen as being penalised, but as the minimum cost that would have been asked if the puzzle did not exist in the first place. E.g. I posted about my Coded Mechanism Puzzle in an earlier blog. 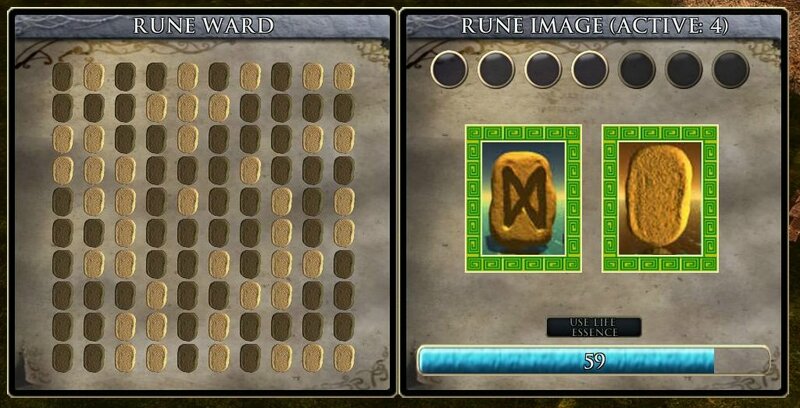 In this puzzle, the player can choose to try to solve the puzzle to move the plot forward at no cost or use Decipher Tools to bypass it instead. 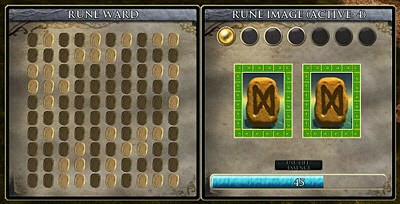 If the puzzle had not existed, the same obstacle would have cost the player an amount of gold equalling the cost of the Decipher Tools that were used to bypass this puzzle. In other words, a DM or builder provides a puzzle to allow the player to get something for nothing if they take the time and effort to try to solve it. The other problem with designing puzzles for a CRPG is that there is no immediate contact with a DM to offer hints and clues to solve the puzzle (unless playing with a DM). 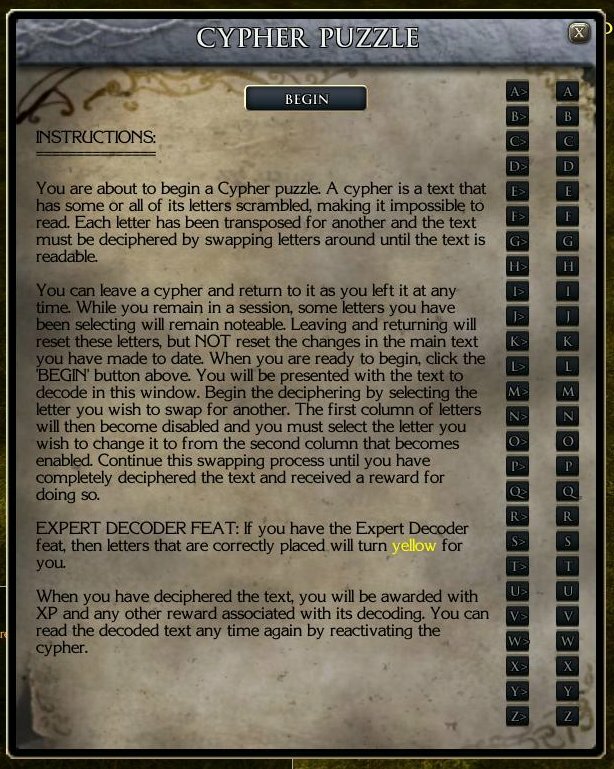 For the games where no DM is present (SP gaming), I have designed a new feat for the player to take for their PC, called Expert Decoder. This feat is geared towards players who enjoy puzzles, but feel they need just a little more guidance or more time to solve them where a time limit is involved. 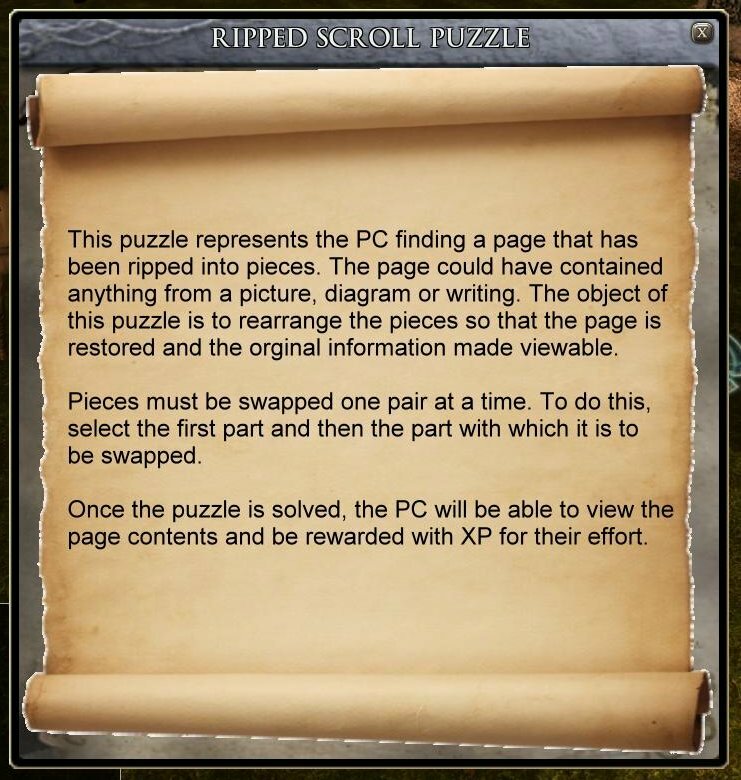 If this type of player takes the new feat during character build or when levelling, then the extra hints and time come as a reward for their PC learning choice. 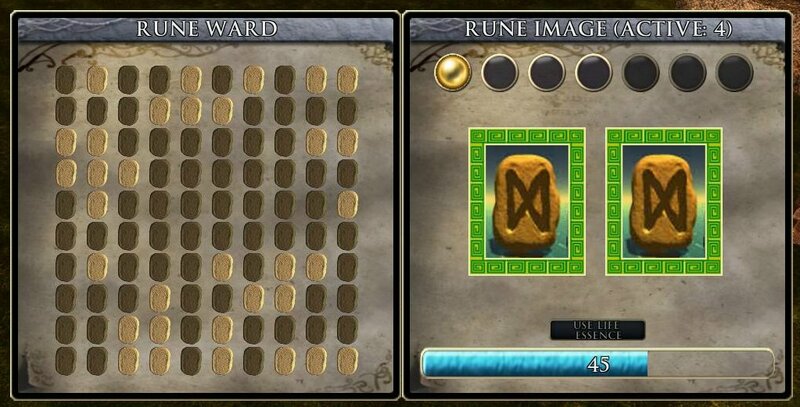 RUNE WARD PUZZLE: Some locks are protected by dwarf rune magik. No normal lock is presented, but a magikal lock that only an agile mind and a good dexterity can overcome. Basically, the player is presented with a grid that represents the locking mechanism and its components. 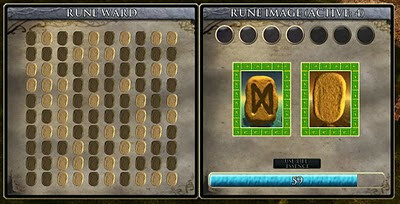 Once activated, the player must match the number of runes required to deactivate the mechanism within a time limit. Some locks are harder to bypass than others, but all allow the PC to sacrifice Life Essence to bypass the lock if need be. Furthermore, a PC with the Expert Decoder feat is allowed a time bonus when trying to deactivate the lock. CYPHER PUZZLE: Sometimes the PC will be up against an intelligent foe. Knowing their plans may be foiled by interfering adventurers, they ensure their communications with their troops are kept encoded so that only those that know the code can translate the message. 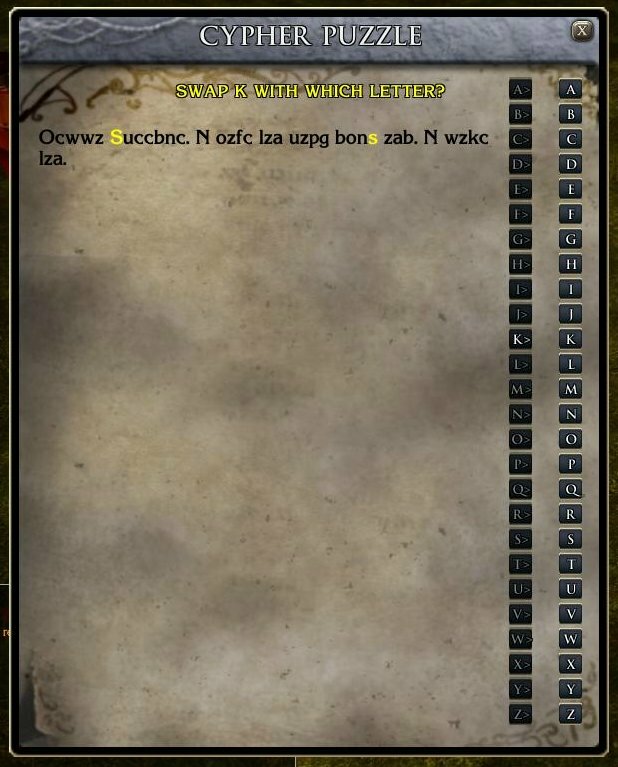 However, if any of these messages do fall into the hands of the PCs, then they may spend some time looking at the text to see if they can crack the code and understand the message. There is no time limit involved when trying to decipher a text and there is currently no way to bypass this puzzle. However, the PC who has the Expert Decoder feat does get a clue if they are proceeding correctly. The yellow letters represent a correct letter if you have the Expert Decoder feat. 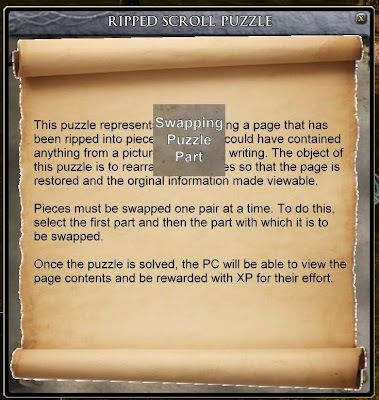 RIPPED SCROLL PUZZLE: A page with some useful information has been torn and thrown away. The PCs manage to gather these parts and want to see what was on the page: an important letter, a picture containing a clue, or just an old shopping invoice? This is a simple 25 piece block puzzle. The player is presented with a jumbled image comprised of 25 scrambled parts of an image. As it currently stands, there is no time limit to this puzzle, but neither is there any way to bypass it or gain an advantage with the Expert Decoder feat. 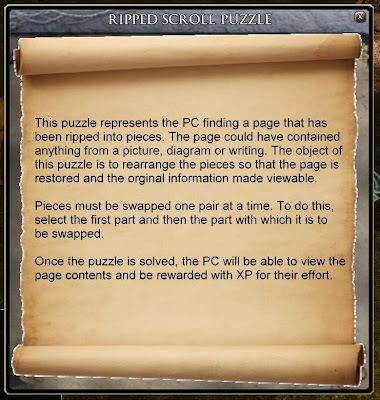 Player Is Presented With The Ripped Scroll Puzzle Instructions. With all these puzzles, however, I want the player to realise while playing them that they are more than simple games, but a means to overcome an obstacle that will move the plot forward, with the exception of the potential tavern game, which can have its own interesting twist. In every puzzle, I have tried to give extra thought and attention as to how it will work in a MP environment as well as a SP game. For instance, I have decided that while all players may have the Cypher Puzzle open to see, only one player (the one who first discovers the puzzle) can operate the buttons. Note, however, there is nothing to stop this player from leaving the puzzle and allowing another player to act as the main player instead, leaving the first as an observer instead. I have asked this before, but will ask it again: In the light of the current puzzles explained, do you have any thoughts or suggestions to add? Most of all, is there a puzzle or mini game concept that you would like to see if possible? I have tried to take on board comments in the past, and have greatly appreciated feedback to date. If, however, you believe I have missed an important point, then please let me know. It's hard to make suggestions when you seem to have already put so much thought (and work) into it. Those are some very nice-looking puzzles. I like way you've provided in-game options to bypass or aid in solving puzzles. I've contemplated similar things in the past. My only general comment on puzzles is that, as a player, I don't like it when the whole game comes to a halt while I have to solve one. I like puzzles overall, but I don't always feel like doing them. So I guess I prefer optional puzzles, and/or ones I can come back to later. As I currently have it set up, I would say that nearly all my puzzles can be set aside to come back to at another time (if not in the mood) and I hope do not cause any bottle-neck situations for players. I believe any puzzle that *needs* to be passed, currently has an alternative means of solving/bypassing it. Those puzzles that do not are either easier to solve in the first place (in my opinion) or something that I need feedback on to alter. E.g. There is a potential (I imagine) for a Cypher Puzzle to eventually leave a player stuck until they solve it. That said, maybe I can look at this again as required. No, I'm not a fan of puzzles. But if someone's going to do them, then they should be done right. I appreciate that these are well constructed (at least they certainly look so). Even if I make not like them myself, it expands what can be done which is always a good thing. Your Puzzle mechanism looks NEAT! I like puzzles as long as the module does not ground to a halt because of them. I like them when they are integrated into the module. I don't like them when I play a 6 int barb and the party wizard has no part in solving the puzzle. The fact that you are using a custom feat implies to me that your module may not be compatible with Kaedrin's Class Pack which I use every chance I get. It is not difficult to be compatible with Kaedrin's. It just requires setting up a few events then it'll work fine from the override or campaign folder. Why not use one of the skill focus feats, such as disable device, instead of creating another feat. 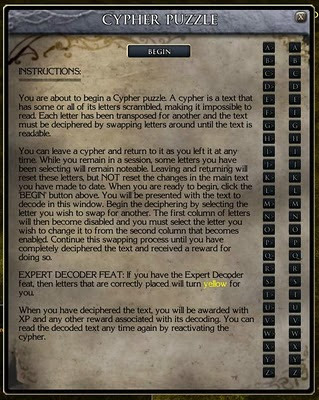 I'm guessing that Expert Decoder is a passive feat that just gets checked in convo or script? Glad you like the look of some of these puzzles. 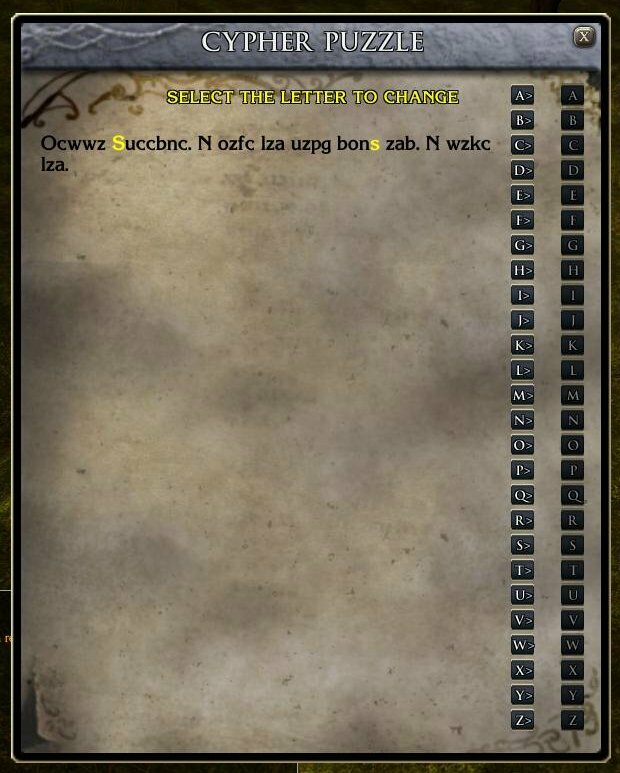 Unfortunately, as it stands at the moment, I am not looking at making my module compatible with other class altering systems ... mainly because there are *too many* aletrations I would have to make and it would add too much time. Hopefully, the difference and challenge of the mod will attract players all the same. Time will tell. Hopefully, I wil make all puzzles appear to make sense to a degree (and perhaps a little poetic licence) and allow bypass wherever possible. I imagine there will only be one or two situations that might possibly set the flag to FALSE ... hopefully not enough to warrant avoidance altogether. CHAOS WIELDER: I like puzzles! Now, actually, that's with a caveat: they need to make sense in the game context. Here's a bad example. In Hordes of the Underdark, the Mindflayer City has these doors in their inner sanctum which require you to solve basic math problems(like find the prime number, etc). These *were* puzzles, but they made almost no sense in the game context. Why would the illithid have them? Who installed them? Why? I mean, think about it, the only things that *could* make it to their inner sanctum were either adventurer's, such as yourself, or mind immune creatures(golems). So the idea that they needed math problems to keep foes out is a bit hard to swallow. "Here's the idea Yggthulas: number doors. They'll be sure to keep our enemies out. I mean, we're spawned from the depths of a star millions of lightyears away, but even I'm afraid of middle-school math." That all said...I think your puzzles look like fun. Do you plan on releasing the systems onto the vault? I understand a builder does, and should, keep some things on their own, but I guess it's a question. MAT RIEDER: Lance, those puzzles look amazing! Really spectacular work, as usual! I enjoy puzzles and games in games I play. The ones you posted on your blog were interesting, I especially liked the "singing stones" idea. I also enjoy more involved ones that may involve logic, and multiple steps and even levels. I recall fondly a logic puzzle in one of the XP's, called "devils and demons" or something like that, sorry, can't remember the particulars. I like really hard riddles too. PJ156: Any really well turned out content like the puzzles you have in the blog go down well with me. I am not a huge fan of puzzles however and like CW I think they need to be in context or I lose interest. Games on the other hand are different. A simulated card game of roulete game etc I love. These tend to be sideshows, something you can dip in and out of. As a scripter you can still display your skill and enjoy the challenge of creation but you are not placing unbelievable and sometimes frustrating obstacles in the path of the player. If the puzzles were presented in this way, as games if you like. Then that would make me a happy camper. The risk (and having read your blog I know you are not in this camp) is that you risk trying to outsmart the player with your wonderful puzzles, when actually they just want to be entertained. 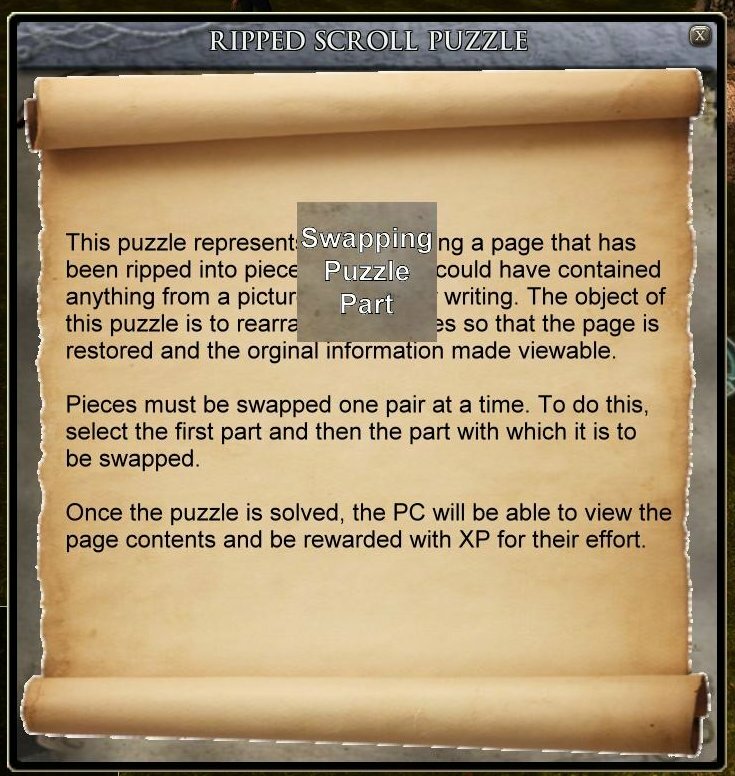 I read about your trying to have a way round the puzzle should the player so choose and I think this a good idea. For me a good example of a puzzle is having a number of levers that have to be in a certain pattern to unlock a door. Theoreticaly anyone having to use that door will know the code but a first timer must work it out. The floor patterns in the Umberlee temple in SoZ was a bad puzzle IMO, difficult to do with no hints local to the puzzle andpointless in the context of the game as far as I could see. I started drooling once I saw those screenshots of that puzzle ! Which one in particular ... 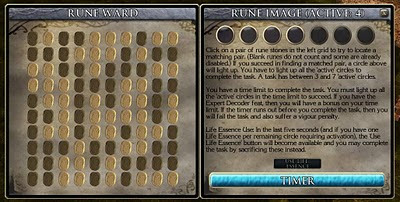 The Rune one? Glad you like them all the same.